Want to organize a Michelangelo exhibition? Buckle up—it’s going to be a wild ride. 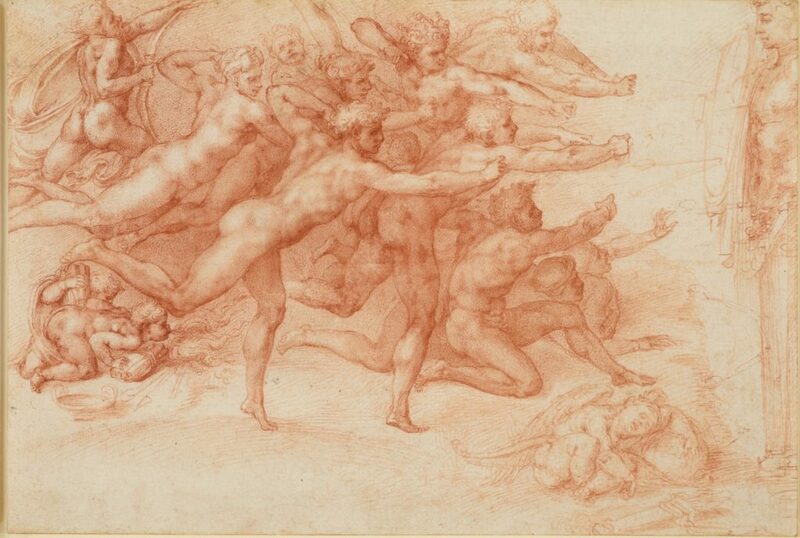 The Metropolitan Museum of Art’s stunning survey of Michelangelo drawings (on view through February 15) required astronomical funds, years of research, drawn-out negotiations, and countless logistical hurdles. “Michelangelo: Divine Draftsman and Designer” brings together the largest group of original Michelangelo drawings ever assembled. It includes more than 200 works from over 50 institutions and private collectors—including the Queen of England herself—and examines the central role drawing played in the development of the artist’s painting and sculpture. But the process of putting together the show was more akin to executing a military exercise than developing an art exhibition. Below, we’ve assembled a step-by-step guide to how the Met pulled off this remarkable feat—and why it’s unlikely to ever happen again. 1. Come up with a new—and groundbreaking—idea. For curator Carmen Bambach, a Renaissance art expert who has studied Michelangelo since she was a teenager, the first step in the arduous journey began eight years ago with the formulation of an exhibition concept. Michelangelo Buonarroti, Unfinished cartoon for a Madonna and Child (1525-30). Image courtesy Casa Buonarroti, Florence. Bambach’s idea—to track Michelangelo’s artistic development through his drawings—was a particularly challenging one to execute. It is difficult for scholars to trace Michelangelo’s work across his long life because he frequently destroyed or disavowed work—particularly early work—that didn’t meet his high standards. Michelangelo earned the nickname “divino” (divine one) early on, and he went to great lengths to maintain the perception that his artistic talent was effortless and divine. He also often obscured evidence of his apprenticeship under his teacher, Domenico Ghirlandaio. 3. Identify the works you want. The Met exhibition includes loans from no fewer than 50 public and private collections in the US and Europe, including the Louvre in Paris and the Vatican Library. The owners are, understandably, extremely protective—and the works’ limited accessibility makes the research process extra challenging. “It is very difficult even for a scholar to get access to Michelangelo’s drawings in the original,” Bambach says. Some museums keep a long waiting list of scholars, who are only permitted to see the works once in their lives. And “even for a scholar who is allowed to see Michelangelo drawings in the original, you go to each collection and you see them one by one, which is a very different experience from seeing things together,” Bambach notes. Once the exhibition concept is finalized and the initial research is complete, the process of securing the loans—a kind of logistical Olympics—begins. Many of the drawings in the exhibition are more than 500 years old and so fragile that they must be stored in the dark for at least three years to recover from extended light exposure. As a result, loans must be reserved several years in advance so that lending institutions can coordinate rest periods for all the requested drawings. Michelangelo Buonarroti Young Archer (ca. 1490). Photo: The Metropolitan Museum of Art, Lent by the French State, Ministry of Foreign and European Affairs. 5. Get officials to agree. Getting a museum or collector to agree to loan a work is only the first step. Some of the drawings are so valuable that they require an additional layer of approval from local authorities and national culture ministries—particularly in Italy and Europe. (To secure loans from Britain’s Royal Collection at Windsor Castle, the museum had to get Queen Elizabeth II to sign the agreement herself.) The negotiations with local authorities often involved multiple face-to-face meetings, formal presentations, and mountains of paperwork. Michelangelo Buonarroti Studies for the Libyan Sibyl (recto); Studies for the Libyan Sibyl and a small Sketch for a Seated Figure (verso) (Ca. 1510-1511). Photo: The Metropolitan Museum of Art. 6. Get the works to New York. Once the loans were secured, Bambach faced another massive hurdle: transporting the irreplaceable art to New York. The Ashmolean Museum in Oxford and the Louvre, which loaned the greatest number of works (26 and 14, respectively) sent the artworks in several separate humidity- and temperature-controlled shipments to guard against theft and damage. Each shipment was accompanied by up to three couriers (either curators or conservators) depending on its size and value. Similarly, each of the three marble sculptures in the exhibition had to travel upright inside a custom crate with lots of support. 7. Install the drawings—very, very carefully. After Bambach got the work to the museum, she had to install it. Such a feat requires nerves of steel—and a forklift to match. The show includes a full-scale preparatory drawing of a Vatican fresco depicting the crucifixion of Saint Peter (1490) housed in a protective metal box that weighs 650 pounds. The installation process took half a day and required a forklift, two scissor lifts, and 40 people to ensure that the drawing remained upright at all times and was not subject to vibrations. Michelangelo Buonarroti Female Figure Seen in Bust-Length from the Front (Cleopatra) (1530–1533). Photo: Casa Buonarroti, Florence. Indeed, at least one lender to the show, the Uffizi, has said it will not loan one of the works—Michelangelo’s The Annunciation—again. The result of all this is a presentation that, quite literally, will never be repeated. But considering all that it takes to pull it off, who would want to put themselves through the process twice? “Michelangelo: Divine Draftsman and Designer” is on view at the Metropolitan Museum of Art in New York until February 12.